We’re on to the bye week… isn’t it crazy how perceptions change? The Patriots are considered to have had a downer of a season. And yet they’ve won 11 games are getting a bye in the first round of the playoffs because of their thumping of the Jets this afternoon in Foxboro. Yes, before any of Negative Nancy’s are quick to remind everyone, which I’m sure the hot take artists already are…the Jets mailed this one in. This had none of the intensity we’ve come to expect from the Patriots-Jets games, however, that isn’t what’s important. What is important, is that the Patriots had a job to do today and that was they had to take care of business, win the game to secure a bye week for the team and then prepare for the Divisional Round. Check and check. Bill Belichick was happy, he was giving much longer answers than normal and despite his normal dour expression, knew that the team performed exactly as they should have. He said it best when discussing the game in his post-game presser when he asked about the significance of the win and the season. “There were some good things, and there were some things that could’ve been better – but in the end, we are where we are,” Belichick said. “Essentially we won next week because we won today.” Boom… mike drop. We don’t know how far this team will go, but we say that every year because the playoffs are a one-game elimination where anything can happen, but in the end, as Belichick said, they are where they are. That is one win away from an eighth consecutive AFC Championship Game. On Friday we posted our keys to the game and key matchups where we broke down the game positionally. And we hit on some and missed on others. That doesn’t seem like a big point because it seemed like he always did that. But lately, he’d been too locked into certain players. Not so on Sunday. There was a much more even spread to things and that ended up with one of Brady’s best games in a while. Brady finished 24-33 (72.7%) for 250 yards with 4 TDs and 0 INTs with a passer rating of 133.8, which was his highest rating since Week 3 of 2017 against Houston. Other than overthrowing a wide-open Chris Hogan in the end zone, he was very sharp and made several really nice throws, his best was the touchdown pass to Rex Burkhead for an 18-yard touchdown. Chris Hogan, who we were about to put on a milk carton, was rediscovered in the offense today and was targeted 11 times and had six catches for 64 yards. He was wide open in the left half of the end zone where Brady badly overthrew him from the 18, or his numbers would have been even higher. But today was a very welcome sight. Julian Edelman and Phillip Dorsett each had five catches, James White chipped in four as the production was spread around pretty evenly. Rob Gronkowski had two catches for 24 yards but had a 30-yarder wiped out by a penalty. We said we wanted to see the ball spread around more…and they did exactly that. And when they do that, this offense is much harder to game plan around. The Jets had a sound game plan this week, they knew the Patriots were going to try to run the ball, as they did against the Bills last week. And with the passing game scuffling, they were going to take their chances there. So, they were bringing a safety up into the box at the snap and by bringing that extra body up, made it harder for the running game to find the room at the line of scrimmage. But it opened up room in the passing game, where Brady (as we mentioned above) was very efficient. But regardless, Josh McDaniels kept things moving along and still found ways to keep the running game going. The Patriots were still able to grind out 131 yards on 30 carries and before three Brian Hoyer kneeldowns, they were averaging 4.96 yards per rush. That creativity is what they’ll need in two weeks and beyond. 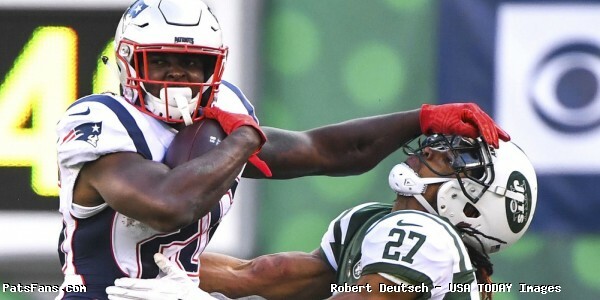 While Sony Michel had just 50 yards on 14 carries, he once again came very close to breaking a couple of deep runs. He finished off a very solid rookie regular season with 931 yards rushing and that was with no preseason action and in just 13 games. The Jet sweeps called by McDaniels were once again very effective, a total of four for 40 yards. Two by Julian Edelman for 24 and two by Dorsett for 16. James White added a really nice 21-yard run in the mix. The Jets were banged up at wide receiver but Sam Darnold threw for nearly 350 yards and three scores last week against Green Bay. And regardless of who is on the field, you still have to make plays. The run defense was solid all day, the only aberration was a scramble from Darnold that went for 28 yards. Elijah McGuire was bottled up for the entire first half, at one point having nine carries for nine yards, one of which went for 17, so he essentially had eight carries for -8 yards when the game was still in doubt. He ran better in the 2nd half but by then the Pats had gone to lighter fronts to get after Sam Darnold who was forced to throw more. Darnold finished 16-28 for 167 yards with 0 TDs, 0 INTs and a passer rating of just 74.6. The Patriots were blanketing his WRs, especially Robby Anderson who was covered by Stephon Gilmore (3 catches, 24 yards). After that absolute stinker in Miami, the defense held Pittsburgh to 17 points, Buffalo to 12 (with a garbage time TD) and the Jets to three. That’s trending in the right direction. Gilmore and Trey Flowers have had outstanding seasons. And the Pats secondary has been one of the strengths of the team this year. There is still some question about the middle of the DL in the running game, but with Danny Shelton back inside, we’ll see how that works out. In the six games since they came off the bye, they’ve held all of their opponents (except Miami) to 17 points or less. The defense has been pretty opportunistic this season forcing 28 turnovers (18 interceptions, 10 fumble recoveries) the most the team has had since 2013. They forced three more on Sunday, Trey Flowers punched the ball out of McGuire’s hands in the first half, which they turned into a touchdown shortly after. Adam Butler knocked the ball out of Darnold’s hand which Kyle Van Noy scooped up and returned 46-yards for a TD (which will thrill a certain 2-6 radio show) and Jonathan Jones stripped the ball on the Jets final offensive play before Hoyer’s kneeldowns. This is important because these things to tend to snowball one way or the other. When a defense isn’t getting any turnovers, they seem to go a long time without one. When a defense starts to get a bunch, that trend also seems to snowball…in a good way. Another stat to consider is that the defense also had another 10 turnovers by stopping the opponent on downs. The Patriots came out of the game relatively unscathed, Devin McCourty suffered a concussion, but he’ll have two weeks to get ready for whoever gets the nod, and that game will be here in Gillette Stadium on Sunday, January 13 at 1:05 p.m. The Patriots will play either the Texans, Ravens or Chargers, whoever is the highest remaining seed. The Patriots and the Chiefs get the bye and Kansas City, by clinching the top seed in the AFC will draw the lowest remaining seed. The games should be interesting to watch this week, but we’ll be watching and trying to look at how this crazy 2018 NFL season continues to play out. 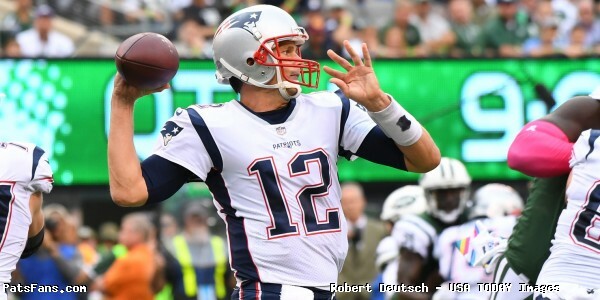 This entry was posted in 2018 Patriots Regular Season, NFL Commentary, NFL News, Patriots Commentary, Patriots Film Room, Patriots News and tagged Bill Belichick, Chris Hogan, Devin McCourty, Elijah McGuire, James White, Julian Edelman, Kyle Van Noy, New England Patriots, New York Jets, NFL, NFL Week 17, Phillip Dorsett, Rob Gronkowski, Robby Anderson, Sam Darnold, Sony Michel, Stephon Gilmore, Tom Brady, Trey Flowers on December 31, 2018 by Steve Balestrieri. The New England Patriots finish off the 2017 regular season by taking on the New York Jets in Foxboro’s Gillette Stadium. The teams have moved in different directions since the last time the teams met in Week 6. Both entered that game at 3-2 and since, the Patriots are 9-1 and are in line for the AFC’s top seed. The Jets are 2-8 since that matchup and are left looking for answers. This week’s game will be broadcast by CBS on Sunday, December 31 at 1:00 p.m. ET and can be seen on WBZ-TV Channel 4. Jim Nantz will handle play-by-play duties with Tony Romo as the color analyst. Tracy Wolfson will work from the sidelines... The game will also be aired on the Patriots flagship radio station 98.5 The Sports Hub with Bob Socci and Scott Zolak on the call, produced by Marc Capello. 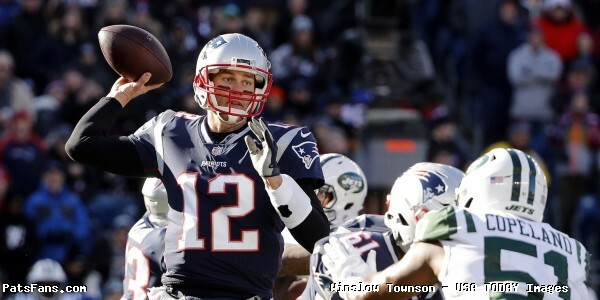 The Patriots (12-3) took care of business last week by defeating the Buffalo Bills 37-16. Dion Lewis rushed for a career-high 129 yards as the Patriots ground out nearly 200 yards on the ground. The defense held the Bills to just three field goals. The Jets (5-10) lost to the Los Angeles Chargers 14-7 as they limp to the season’s finish line but still are playing hard for coach Todd Bowles. They’ve been in all of their games this season and looking to the future. The Patriots and Jets are meeting for the 118th time. The Patriots hold a 62-54-1 edge overall. The Patriots are 33-25-1 all-time at home against the Jets. The Patriots have won the last three matchups and the past two wins by Gang Green have been in overtime. One of which was in 2015 with the famous “pushing rule” game which cost the Patriots home field advantage in the playoffs but wait, the Pats get all the calls right? The Patriots running game has been steadily getting better as the season goes along and Dion Lewis has emerged as the Pats go-to back. Last week against the Bills, they were missing Rex Burkhead and James White, but Lewis and Mike Gillislee gashed the Buffalo defense for nearly 200 yards. The Jets, like the Patriots, have had issues stopping the run and have allowed 116 yards per game. In the first matchup this season, New England ran for 125 yards. The key matchups will be how effective the Pats offensive line is at getting to the second level against a good linebacking core. Lewis will be the main back again, however, with Burkhead on the shelf, Gillislee has missed practice time with a knee injury. 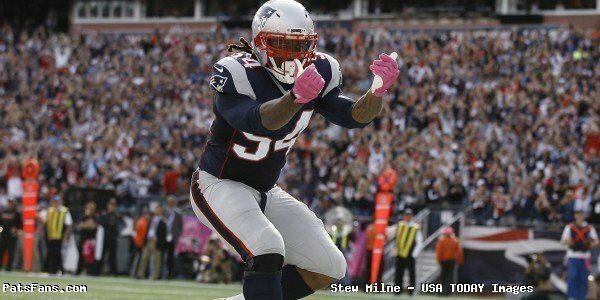 If he’s unable to go, we may see more of Brandon Bolden this week. The Patriots passing game is still missing a ton of key players with Chris Hogan, White, and Burkhead out. But the good news is Malcolm Mitchell is back and is slated to play some this weekend. 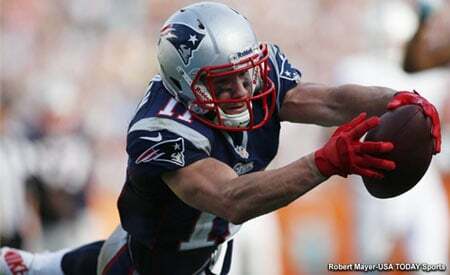 He’ll no doubt have some rust issues but his return is very good news for the passing offense. 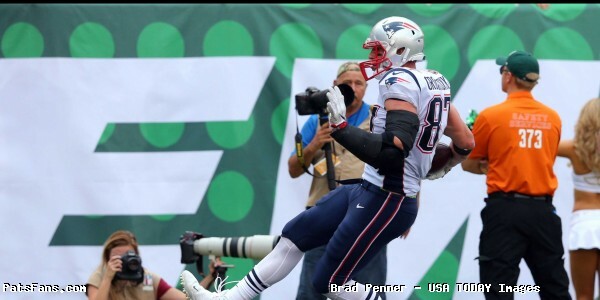 Matching up with Rob Gronkowski has to be the Jets priority on Sunday. I’d expect to see him doubled this week. The Jets have done a good job of defending the pass this year allowing just 237 yards per game. They’ve only had two teams pass for 300 yards or more against them this year. Their improved secondary begins with the two rookie safeties Jamal Adams and Marcus Maye who have come in and played much better than anyone could have hoped this early in their careers.Their biggest weakness remains, rushing the QB and if they give Brady time, he should have a big day. Gronkowski had a big game with two touchdowns in the last matchup and the Jets will have to find a way to slow down the big man. It will be up to the other players on the offense to make them pay if they decide to double Gronk. Brandin Cooks will have to step up this week and make the Jets force coverage toward him. The Jets have a very good running back in Bilal Powell and he is coming off a big game last week (145 yards) against the Chargers. Look for the Jets to test the edge of the Patriots defense which has been leaky for much of the season. Powell missed the first game and has usually played well against the Patriots. The Patriots run defense has had major issues this season defending the run especially on the edge and they’ll be short inside with Alan Branch still out injured. But there are a couple of silver linings this week. Malcom Brown played arguably his best game of the season last week against the Bills and the Patriots just picked up James Harrison. The Steelers all-time sack leader is closer to the end of the road than the beginning but I think he’ll be looked to primarily help with setting the edge here. If he can do that, then his time here regardless of his pass rush ability, will be a success. We don’t know how much he’ll play this week, but they’ll be a lot of eyes on him and we’ll be focusing on the running game first. Josh McCown is out for the season and the Jets now have Bryce Petty under center. He has some good weapons in the passing game, Robby Anderson and Jermaine Kearse outside, tight end Austin Seferian-Jenkins and Powell out of the backfield. The problem has been protection this season. Jets QBs have been sacked 43 times in 2017. The Patriots pass defense has been light years better since the first Jets matchup where McCown threw for 350+ yards. The secondary didn’t have a good week against Buffalo last week and will be looking to enter the postseason on a high note. Look for Matt Patricia to be a bit more aggressive this week with Petty under center than McCown. We’ll see some safety or corner blitzes and some A-Gap pressure as well. The Patriots’ Special Teams are among the best in the NFL, they excel in punt and kick coverage and continuously turn in big plays. The Jets STs units are a step below the Patriots and don’t have the edge anywhere here. But they showed last week that they’ll be aggressive, starting off the Chargers game with a successful onside kick. Expect them to empty the tank this week. This key here from a Patriots perspective is getting off to a fast start. Game time temps are slated to be 10-15 degrees with a wind chill below zero. The Jets, although they’ve played hard all year are playing for nothing but pride. If New England gets off to a quick start, they may just want to fold up tents and get home to watch the ball drop in Times Square. Turnovers are key here as well. The Jets don’t have a prolific scoring offense so ball control and not turning it over is key here.They can’t give the Jets any short fields and any momentum to pull off the upset. 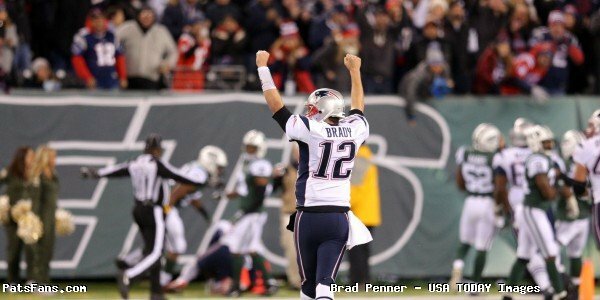 This entry was posted in 2017 Patriots Season, NFL Commentary, Patriots Commentary, Patriots News and tagged 2017 Patriots Season, Bilal Powell, Bill Belichick, Bryce Petty, Buffalo Bills, Chris Hogan, Danny Amendola, Dion Lewis, James White, Jermaine Kearse, Malcolm Butler, New England Patriots, New York Jets, NFL, Patriots, Patriots edge rushers, Rob Gronkowski, Robby Anderson, Tom Brady, Trey Flowers on December 29, 2017 by Steve Balestrieri.